NEW YORK (AP) — Tom Wilson had extra time to work on his skills while serving a suspension during the first 16 games of the season. It’s paid off in a big way for the Washington Capitals since his return. 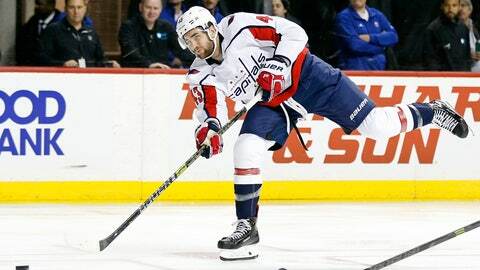 Capitals coach Todd Rierden has noticed the difference in Wilson’s play. Trotz, Islanders assistant coach Lane Lambert and goalie coach Mitch Korn, received their championship rings in the Capitals’ dressing room before the game and addressed their former players. Leading 2-1, Washington had a two-man advantage for 1½ minutes. After several attempts were stopped during the 5-on-3, Wilson beat Greiss in front about 15 seconds after the Islanders’ first penalty expired for a power-play goal to push the Capitals’ lead to 3-1 with 5:39 left. Tied 1-1 after one period, New York nearly regained the lead early in the second as Washington defenseman Matt Niskanen almost stuffed the rebound of Pulock’s shot off Holtby and across the goal line. After a review the no-goal call stood as officials confirmed the puck didn’t cross the line. Filppula opened the scoring just 36 seconds into the game with a backhander past Holtby’s glove side for his seventh. NOTES: Nicklas Backstrom had assists on both of Wilson’s goals, pushing him past Peter Bondra for second place on the Capitals’ career points list with 826. … John Carlson had an assist on Dowd’s goal, tying him with Kevin Hatcher for third on the Capitals’ career list for assists by a defenseman with 277. … The Capitals improved to 12-4-3 in their last 19 games vs. the Islanders. … Filppula, who has scored in two straight games, has eight points in the last seven games. … F Leo Komarov had an assist on Filppula’s goal, giving him six points the last seven games.